Functions to simplify and unique text formatting in scenarios and help files. Most of these functions are simple wrapper functions that make working with the widelands rich text formatting system more bearable. Function names generally follow HTML names. We strongly recommend that you make use of these functions rather than hacking the tags manually. If you’re writing a scenario, you should also have a look at richtext_scenarios.lua. This section covers functions for structuring your text layout. Wraps a block of text into Lua rich text. Only call this once for the whole text that gets sent to the backend. There is no general need to wrap an rt tag around your text, because the backend will take care of it. So, only use this function if you wish to add some attributes to the tag. text_or_attributes (string) – see the rt tag’s documentation for a list of attributes and their descriptions. text (string) – the text to be enclosed in rich text tags. Wraps a block of text into a div tag. text_or_attributes – see the div tag’s documentation for a list of attributes and their descriptions. text (string) – the text to be enclosed in div tags. the text wrapped in a div tag. gap – the size of the space as pixels. This section covers functions for defining headings and paragraphs. Returns a paragraph formatted as a title heading. Use this on the top of your document only. A paragraph with text formatted as title. Returns a paragraph formatted as a big heading with a small gap after it. A paragraph with text formatted as heading. Creates a line of h3 formatted text followed by normal paragraph text. header – text in h3 format. text – text in p format. header text followed by normal text. Returns one paragraph with text followed by a small vertical gap. Options can be given as first argument similar to rt(). text_or_attributes (string) – see the p tag’s documentation for a list of attributes and their descriptions. Returns a paragraph open tag and default font size. Options can be given as first argument similar to rt(). attributes (string) – see the p tag’s documentation for a list of attributes and their descriptions. p_or_font_attributes (string) – Optional paragraph or font attributes. text_or_font_attributes (string) – Optional font attributes or the text itself. See the p tag’s documentation for a list of paragraph attributes and the font tag’s documentation for a list of font attributes. This section covers convenience functions for text formatting. Wraps the text in font tags. See also p_font. attributes (string) – see the font tag’s documentation for a list of attributes and their descriptions. This makes the text bold. This makes the text italic. This section covers functions for defining lists. 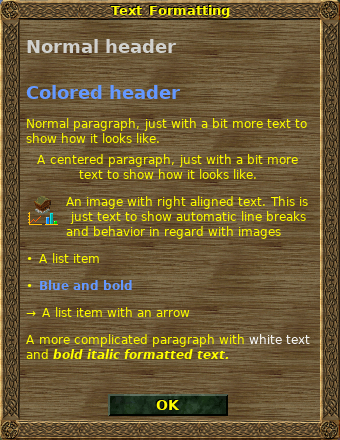 dt – “description term”, will be rendered in bold. dd – “description data”, will be rendered normally. symbol – the item symbol for the list, e.g. “•” or “→”. “•” is the default. the text wrapped in a paragraph and placed next to the image, the outer tag is a div. This section covers functions for including images. Turns an image src path into an image tag for richtext. See also li_image. src (string) – the file path to the image. attributes (string) – see the img tag’s documentation for a list of attributes and their descriptions. This section covers functions for including links. We can’t do real links yet, so we only highlight the text for now. This function imitates a HTML link. We can’t do real links yet, so the text just gets underlines. This section covers functions for text composition that help with proper markup to make the text translatable. Joins 2 sentences together. Use this rather than manually concatenating a blank space, because some languages don’t use blank spaces. two concatenated sentences with a localized sentence joiner. Turns an array of string items into a localized string list with appropriate concatenation. former_textdomain – The textdomain to restore after running this function. The concatenated list string, using localized concatenation operators. body = h1(_[[Normal header]]) ..
p(_[[Normal paragraph, just with a bit more text to show how it looks like.]]) ..
p("align=center", _[[A centered paragraph, just with a bit more text to show how it looks like.]]) ..
li_image("images/wui/menus/menu_toggle_menu.png", _[[An image with right aligned text. This is just text to show automatic line breaks and behavior in regard with images]]) ..
li(font("color=6699ff bold=1", _[[Blue and bold]])) ..
li_arrow(_[[A list item with an arrow]]) ..
p(_[[A more complicated paragraph with ]] ..
font("color=ffffff", _[[white text ]]) ..